When he was named Fairfield's interim first selectman in June, Michael Tetreau sat down with his staff to find out the particulars of their jobs. He learned that Nancy Frey, the first face visitors see when they come to the first selectman's office, oversees the town's Honor Roll of military veterans. The white-paneled monument stands at the front of the Town Hall Green on the Old Post Road, and Tetreau, until he talked with Frey, was under the impression that names of Fairfield servicemen and women were posted on the Honor Roll only if they had died. So Tetreau on Tuesday decided to use the occasion of a visit home by his brother, Army Lt. Col. William Tetreau, to highlight the Honor Roll because he feels that the names of many Fairfielders who served in the nation's military -- and are deserving of recognition -- are not listed on the monument. "The criteria is relatively simple," the first selectman said. "You have to have been a resident of Fairfield when you enlisted in the service." After emailing his brother deployed in Afghanistan for his military form DD-214, the first selectman submitted William's name for inclusion. All submissions are reviewed by a Vetereans of Foreign Wars representative and new names are added to the Honor Roll once a year. "We'd like to make sure everyone who meets the criteria is listed on the memorial," Tetreau said. When his name was added Tuesday to the Honor Roll, Lt. Col. Tetreau said it was a great honor. "I want to thank the town of Fairfield and the military organizations that support this wall, and the veterans who support the community," he said. The first selectman said following Sunday's 10th anniversary of the Sept. 11, 2001, terrorist attacks, "I thought it would be appropriate to bring together our town's veteran officials to highlight this beautiful memorial wall and pay homage to all those who have defended our country, especially our residents who grace the Honor Roll in Fairfield." 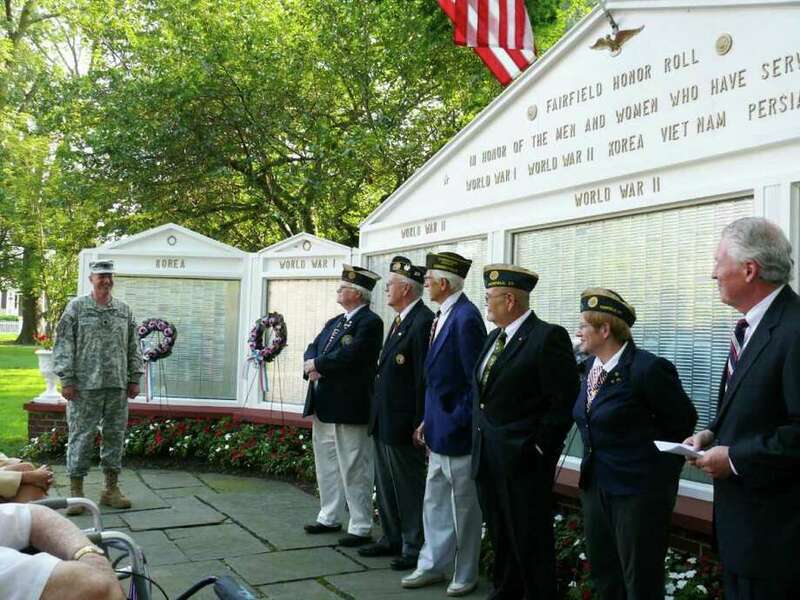 The Fairfield Honor Roll was established in 1945, listing the names of local World War II veterans. The original wooden-framed structure stood on the green for 15 years before it began to deteriorate and had to be taken down. Today's monument, weather-proof and made of anodized aluminum, now lists thousands of names of men and women who served not only in the two World Wars, but Korea, Vietnam, the Persian Gulf (including Afghanistan and Iraq), Lebanon, Grenada, Panama and the Dominican Republic. Private citizens donated funds for the foundation of the restored monument several decades ago, and businesses completed the job. Extra panels have been added over the years to accommodate the growing list of names.